Ten days ago President Trump announced a temporary ban on refugees from seven terror states. The temporary block included travelers from Syria, Iraq, Iran, Libya, Yemen, Sudan and Somalia. The largest Muslim countries in the world were not included in the travel ban. The liberal media is now rewriting history to claim Trump’s temporary ban is anti-American because the Statue of Liberty was based on a Muslim woman! CBS and Yahoo carried this insane story. 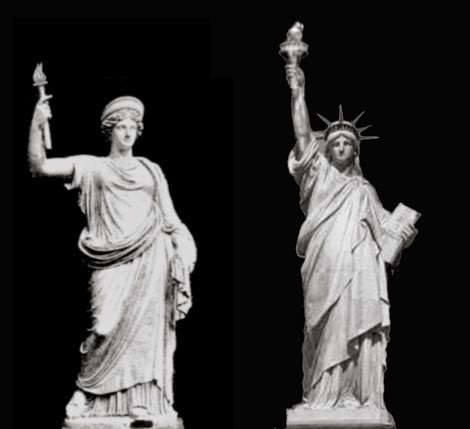 The Statue of Liberty was based on the Roman goddess Libertas. And notice that she is not covering her face or head? The Statue of Liberty was NEVER based on a Muslim figure. Only a crazy liberal would suggest such nonsense.